Stingless bees belong to the tribe Meliponini and are mainly found in tropical countries. Some of them have interesting and unusual behaviours, such as eating dead meat! They are part of the Apidae family, along with honey bees, bumblebees, and carpenter bees. 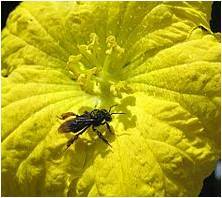 Stingless bees are excellent pollinators of crops and flowers. They are known to visit the flowers of 90 crop species, and to be effective pollinators of 6 species (1), including mangos, macadamia nuts and watermelons, eggplants (aubergine) whilst contributing to the pollination of 60 other species, such as strawberries. 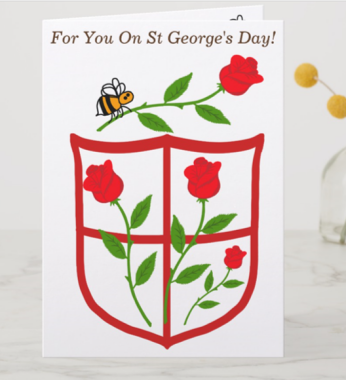 It has also been found that like bumblebees, stingless bees are able to buzz pollinate, and thus have been proven to represent a possible alternative to bumblebees for commercial pollination of tomatoes in Brazil, where there are only 7 native species of bumblebee (2). There are a variety of different nest constructions, but they may be made from wax and resin, and mud may also be added by worker bees. Stingless bee nests are usually found in tree or wall cavities. This is, in my view, one of the most interesting tribes of bees, due to some unusual habits and behaviours. These bees do not collect fresh pollen or nectar from fresh flowers in the way that other species do. Instead, these bees collect dead meat, and also get their sugars from eat rotting fruits or dead flowers, or from extrafloral nectarines (nectar-secreting plant glands that develop outside of flowers and are not involved in pollination). 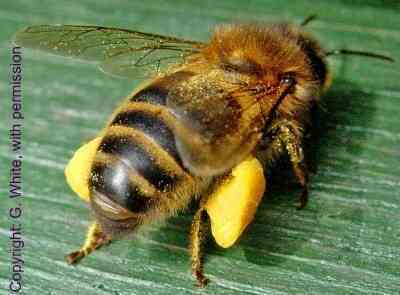 These bees cultivate yeast associated with pollen. 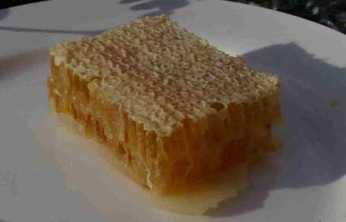 The yeast helps to dry and preserve the life of the stored pollen in the nest. That honey bees and bumblebees may consume aphid secretions of honey dew during lean times (i.e. 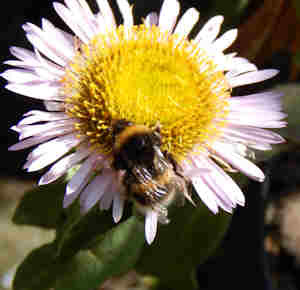 not much available nectar from flowers), is well known - see my pageWhat Do Bees Eat? However, the species of stingless bee, Schwarzula coccidophila, goes further than that! Camargo and Pedro ( 2002 ), observed dozens of nests in Brazil (the bee nests themselves constructed in moth larvae tunnels). The scale insects (Cryptostigma sp.) were found attached to the gallery walls, in the interior of the nest. In return for ‘protection’ and ‘care’ from the bees, the scale insects offered the bees not only honeydew (the sweet secretions), but also the additional wax the bees could use in their nest construction. 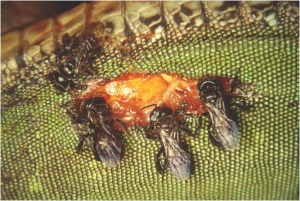 The honey dew secretions are a subproduct of sap from the plant, on which the scale insects feed. The bees encouraged the scale insects to secrete honey dew by stimulating them. These bees are the only known species which have, within their own nest, a permanent source of food and wax production. This species raids the food stores of other bees and transfers them to the storage pots in its own nest. Although some species build their nests in tree and wall or rock face cavities, others build complicated structures in other places. For example, species of Partamona, such as Partamona batesi, build their nests in the nests of other social insects such as termites or ants. 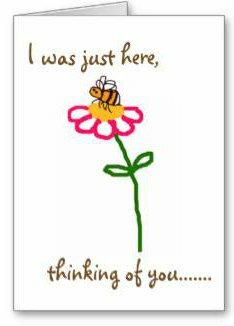 In some countries, certain species of stingless bees are kept in place of honey bees, and produce a small amount of honey. 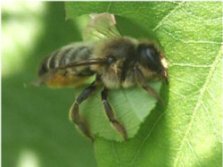 They may also be ‘kept’ not for the sake of honey production, but for general interest and to benefit from the pollination service they provide in gardens. (3) Historical Biogeography of the Meliponini (Hymenoptera, Apidae, Apinae) of the Neotropical Region João Maria Franco de Camargo† and Patricia Vit. Communicated by: David W. Roubik and Silvia R. M. Pedro Conference given at Universidad de Los Andes, Mérida,Venezuela, March 2008. 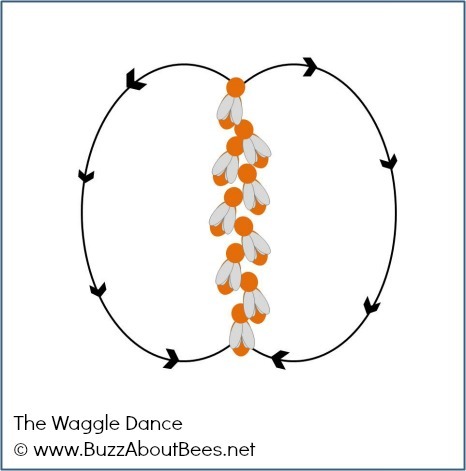 How do bees collect pollen?